Hi folks. I have to be brief today, which means that my pictures and their headings may not line up. Not much to report about yesterday. We met most of our group at the airport and flew to Luxor. A few (including the group leader) got stuck in New York due to weather. They will join us tomorrow, but have missed some wonders. 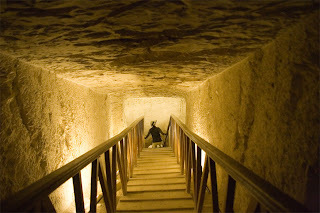 The Valley of the kings what many Pharaohs were buried in elaborate tombs cut deep into the rock. There are no pictures allowed in the tombs, so you can assume that the slightly blurry pictures that appear from tombs here must have been camera malfunctions. 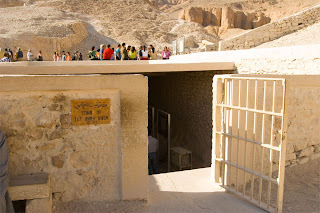 The temple of queen Hatshepsut. 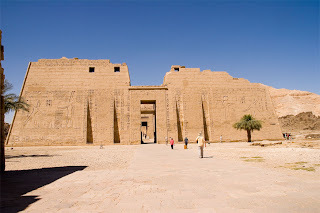 Temple of Ramses the third. Finally, a typical stop and shop opportunity that gives the guide a small kickback from what we buy. Here it is alabaster. You can see Karen Jenison talking with a salesman. What you can’t hear is a sucking sound: That’s the sound of Lynn’s money being sucked into the Egyptian economy. Tomorrow we rise at 4am to catch a very early plane back to Cairo. 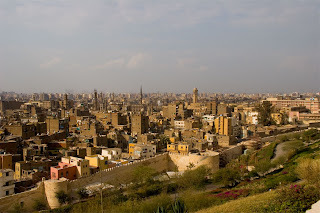 Cairo is city of about 16 million people. Crowded beyond belief. Traffic that downright dangerous. Air pollution that is already effecting Shawn and I after only one day. Most of the people are poor. Still, it is an amazing place. If you're feeling bad for me, don't This is where I ate lunch with one of our Presbyterian missionaries, Dusty Ellington. He's a great guy and a gracious host. 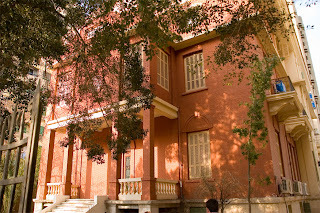 Dusty teaches Greek and New Testament here, at the Evangelical Theological Seminary of Cairo (ETSC). This is a school Presbyterians started for the training of local pastors way back in around 1860. In 1925 the moved to their current site. 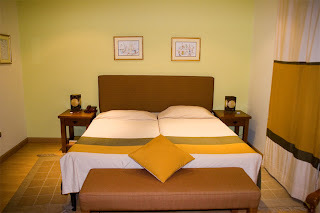 The building is a mix of old-run -down, with some nicely refurbished rooms. 10% of Egypt is Christian and 10% of Christians are Evangelical Protestants. We have some good people here doing some great work. We finished the night at another missionarie's home fo r a birthday party for two missionary kids. 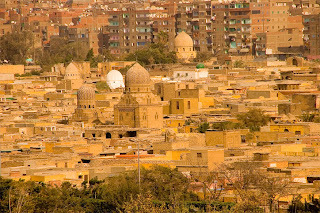 Cairo is an ancient city and has several large cemeteries where the dead are placed in mausoleums. Oddly enough, over 100 years ago poor people started living in these "Cities of the Dead", sharing these rooms with the departed. They have to leave when a family has to come and visit. This is a shot of one of them. 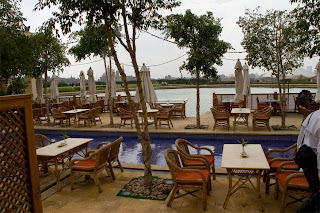 Tomorrow we meet the group and then on to Luxor. We had planned to sleep most of the morning, but couldn't. So we walked around the busy streets surrounding our hotel. 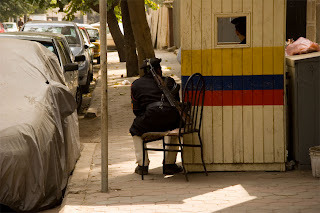 I'm told, this is the nicest part of Cairo, with and schools and embassies. And lots of police all around. At 12:30 a Presbyterian minister who teaches New Testament at the Evangelical Seminary in Cairo will be picking us up for lunch and a tour. I'll be amazed if he finds this place. Well, we made it. 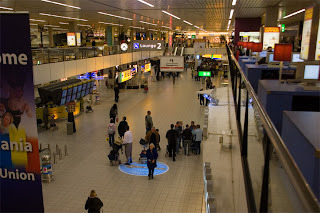 An easy flight from Seatac to Amsterdam, arriving at 7:30am. It was raining steady (it did so all day), so rather than cruise the town, we got a day room at the hotel right in the airport. At 9pm (13 hours after we got there) we got on a KLM plane for Cairo. It arrived at 2:00am. After clearing passport control, we were met by our driver and whisked to our hotel. 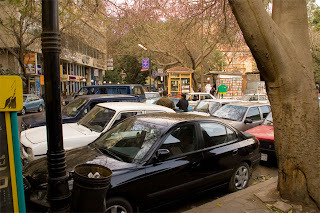 Cairo is 5 million people and it already looks interesting. Our hotel is between fleabag and nice, but will serve our needs for 1 and 1/2 nights until we meet with the whole group. Well, I’m getting ready to hit the road again. On Feb. 23 I leave for Egypt. 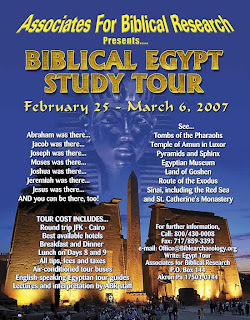 I’ve wanted to go to Egypt for some years, but I wanted to travel with a group and a wanted a trip that focused on Biblical history, not just general Egyptology. I’ll be traveling with a group from Associates for Biblical Research, a Christian group with a lot of interest in archaeological. My friend, Shawn Firminger will join me, as will Karen Jenison and a friend of hers. My plan is to try and post regular reports and pictures. I’m not what internet access I’ll have where we will be staying. I’ve found that it’s just about impossible to upload pictures with a dial up connection. So, keep checking back. I’ll post as often as I can. My flight into Cairo lands at 2:10AM (ouch). We get there a day before the main group, so I’ll use some of the time to meet with a Presbyterian pastor who teaches New Testament at the Evangelical Theological Seminary in Cairo (ETSC). ETSC was founded in 1863 by the American Mission, which was itself an undertaking of the United Presbyterian Church of North America. If you don’t know who the UPCNA were, ask Pins Dawson. The school is now run by the Evangelical (Presbyterian) Synod of the Nile, with a number of Presbyterians serving on their staff and in support positions. 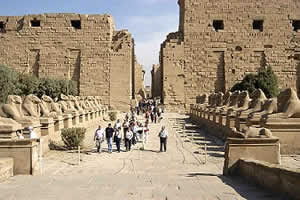 Arrive in Cairo and transfer to a flight to the ancient center of Egypt at Luxor (Thebes) and Karnak. 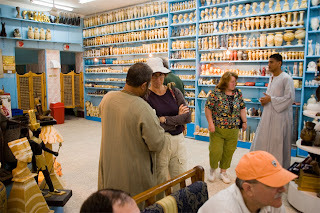 Evening visit to the Luxor Museum and/or a carriage ride through the suk (bazaar). Overnight in Luxor. 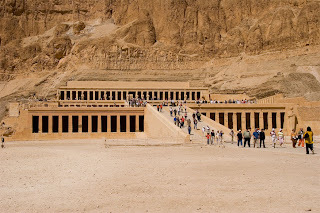 Morning: cross the Nile and visit King Tut's tomb in the Valley of the Kings and Deir el Bahri, the massive Mortuary Temple of Queen Hatshepsut. 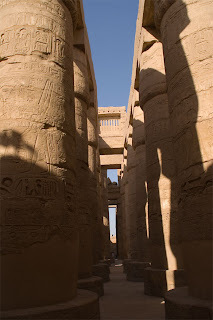 Afternoon: visit to the famous Temple complex of Amun at Karnak, including the relief of Seti I's campaign to Palestine ca. 1300 B.C., inscriptions and relief’s of Merenptah, the Pharaoh who mentioned Israel in his records in ca. 1210 B.C., and Pharaoh Shishak's record of his campaign against Judah and Israel in 925 B.C. Overnight in Luxor. Early morning flight back to Cairo. 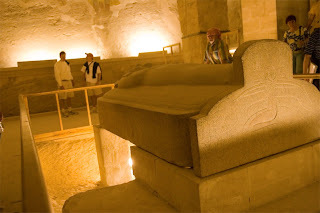 Morning: Visit Old (Coptic) Cairo and see the traditional burial place of Jeremiah the Prophet. 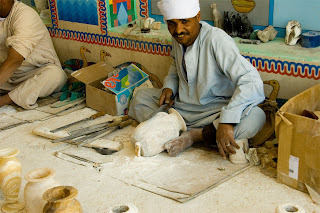 Afternoon: Visit Cairo's famous Egyptian Museum to see many items (and sometimes the people themselves!) from Egyptian history that relate to the Bible. Overnight in Cairo. Morning: See one of the seven wonders of the world: the Pyramids and Sphinx on the Giza plateau. 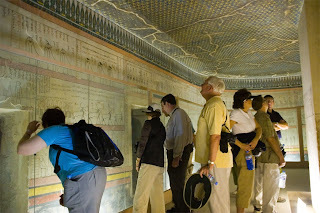 Afternoon: travel to the ancient capital city of Memphis and the pyramids of Saqqara. 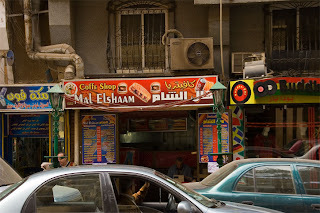 Overnight in Cairo. 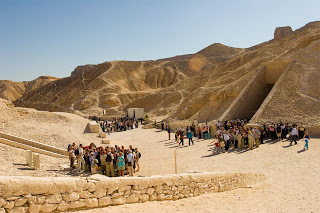 Depart Cairo and travel north to the Land of Goshen where the Israelites lived for over 400 years. See modern villages still operating with some of the same traditional practices the Israelites used. Stop at the ancient royal city of Tanis (Biblical Zoan) (remember Raiders of the Lost Ark?) 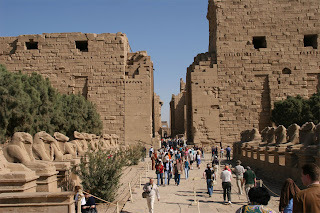 and Rameses where many Exodus events took place. Overnight at Lake Timsah in Ismailiya. Enjoy a morning of leisure and lunch along the shores of the Red Sea. In the afternoon follow the route of the Exodus heading into the interior of the Sinai Peninsula on the way to St. Katherine's Monastery. Overnight at St. Katherine's. Optional: Rise early (very early!) and climb Jebel Musa (sorry folks, but I don’t plan to try this), the traditional location of Mt. Sinai, for an unforgettable view of sunrise over the Sinai. Visit the famous St. Katherine's Monastery where early Biblical manuscripts were found. 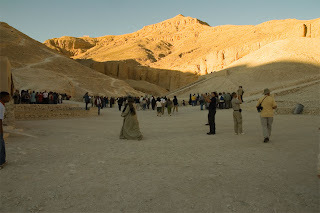 Afternoon: Travel back though Sinai, visiting additional sites and scenes from the Exodus itinerary. 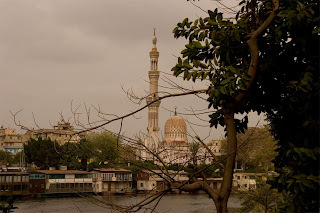 Cross the Suez Canal and head back to Cairo. 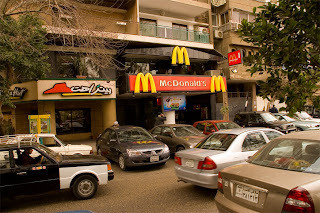 Overnight in Heliopolis, near the Cairo International Airport. 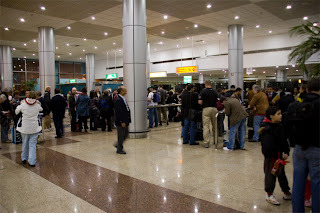 Depart Cairo International Airport for home.